Working as a graphic designer, JR started out creating cheeky statement-makers just for himself, until adulation from both mates and strangers down the pub persuaded him to vend online; he still gauges new ideas by wearing prototypes and noting reactions, marking the only time hard stares in your local netted market research rather than a swift decking. 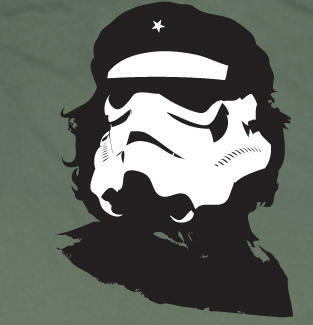 Street/graffiti styles include the "CCTV" series, depicting various citizen-spying cameras, "Gas Doll", featuring a gasmask-clad baby, and the "Che" series, including "Mickey Mouse Che" and "Stormtrooper Che", presumably exclaiming "Viva, la rebel scum!" Further graphics run from a "Loaded Gun" that appears to be tucked into your trousers, to a propaganda-style number that's got a commie looking fella' pointing towards "Progress! ", to a locust-decal'd series with "Tourist" printed in several languages, so that all other tourists will understand that they should be annoyed by you. 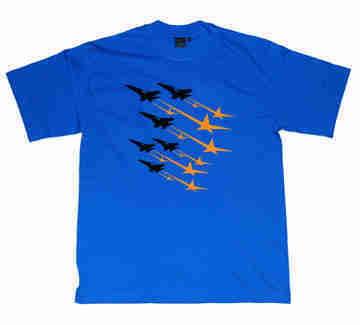 For climate-aware Londoners, JR also has hoodies, including a "2nd Class" freepost logo splashed across the chest, the formation flying, star-propelled military "Jets MK II', and "Guns", featuring 16 neatly-clustered firearms, who have always stuck together, because that's what leedle frens are for.